The path for the flow of alternating current is called an AC Circuit. The alternating current (AC) is used for domestic and industrial purposes. In an AC circuit, the value of the magnitude and the direction of current and voltages is not constant, it changes at a regular interval of time. 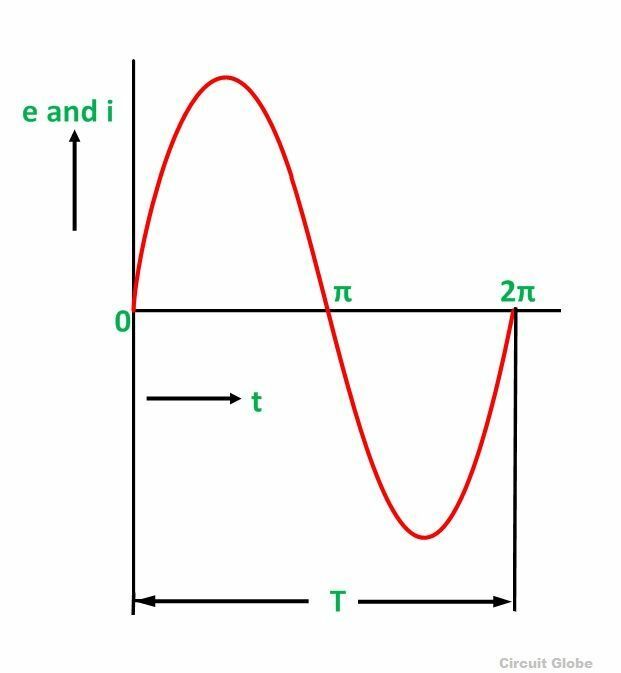 It travels as a sinusoidal wave completing one cycle as half positive and half negative cycle and is a function of time (t) or angle (θ=wt). In DC Circuit, the opposition to the flow of current is the only resistance of the circuit whereas the opposition to the flow of current in the AC circuit is because of resistance (R), Inductive Reactance (XL=2πfL) and capacitive reactance (XC = 1/2 πfC) of the circuit. In AC Circuit, the current and voltages are represented by magnitude and direction. The alternating quantity may or may not be in phase with each other depending upon the various parameters of the circuit like resistance, inductance, and capacitance. The sinusoidal alternating quantities are voltage and current which varies according to the sine of angle θ. For the generation of electric power, in all over the world the sinusoidal voltage and current are selected because of the following reasons are given below. The sinusoidal voltage and current produce low iron and copper losses in the transformer and rotating electrical machines, which in turns improves the efficiency of the AC machines. They offer less interference to the nearby communication system. They produce less disturbance in the electrical circuit. The voltage that changes its polarity and magnitude at regular interval of time is called an alternating voltage. Similarly the direction of the current is changed and the magnitude of current changes with time it is called alternating current.When an alternating voltage source is connected across a load resistance as shown in the figure below, the current through it flows in one direction and then in the opposite direction when the polarity is reversed. The waveform of the alternating voltage with respect to the time and the current flowing through the resistance (R) in the circuit is shown below. 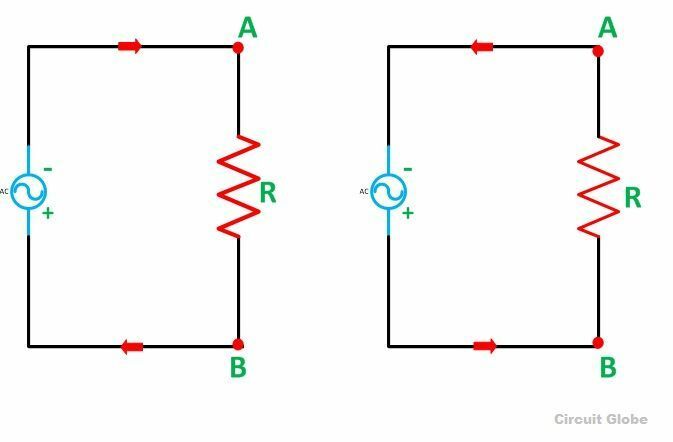 There are various types of AC circuit such as AC circuit containing only resistance (R), AC circuit containing only capacitance (C), AC circuit containing only inductance (L), the combination of RL Circuit, AC circuit containing resistance and capacitance (RC), AC circuit containing inductance and capacitance (LC) and resistance inductance and capacitance (RLC) AC circuit. The maximum positive or negative value attained by an alternating quantity in one complete cycle is called Amplitude or peak value or maximum value. The maximum value of voltage and current is represented by Em or Vm and Im respectively. One half cycle is termed as alternation. An alternation span is of 180 degrees electrical. When one set of positive and negative values completes by an alternating quantity or it goes through 360 degrees electrical, it is said to have one complete Cycle. The value of voltage or current at any instant of time is called an instantaneous value.It is denoted by (i or e). The number of cycles made per second by an alternating quantity is called frequency. It is measured in cycle per second (c/s) or hertz (Hz) and is denoted by (f). The time taken in seconds by a voltage or a current to complete one cycle is called Time Period. It is denoted by (T). The shape obtained by plotting the instantaneous values of an alternating quantity such as voltage and current along the y axis and the time (t) or angle (θ=wt) along the x axis is called waveform.